This Week's Featured Advertisement: The New Victor Reader Stream... Smaller, Smarter and Wireless! The new Stream's slim, sleek, compact design makes it 28% smaller than its predecessor, and features wireless capabilities that open up the world to people who are blind or visually impaired. Imagine having a multimedia library in your pocket! You could have the latest novels, magazines, your favorite music, audio described films, texts, and your own voice recordings all in the palm of your hand. The new Victor Reader Stream can deliver content from your favorite sources, including DAISY, NLS, Bookshare, Learning Ally, plus books and music from iTunes. Now imagine integrated Wi-Fi for automatic software updates and future online features such as book downloads! The new Victor Reader Stream features an improved, louder speaker, improved text-to-speech from Acapela, improved recording capabilities, faster USB transfers, and 32-gigabyte capacity SD cards, plus it easily connects to flash drives. And it offers the Softpak features of full stereo recordings, EPUB2 unprotected books, DOCX support, MP4 and iTunes M4A files, plus a built-in clock. 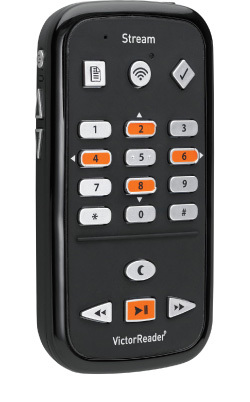 For more information or to purchase the NEW Victor Reader Stream contact us today. 1-800-722-3393. http://www.humanware.com/newstream. 8) This post to the NFT AT blog is called "AFB's AccessNote: Not quite the notetaker replacement we've been looking for."